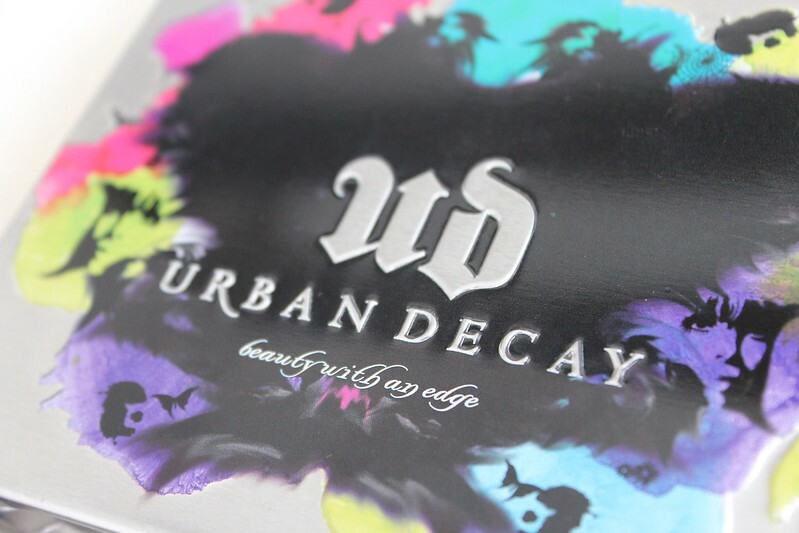 B U B B L E G A R M: Urban Decay - Build your own palette! 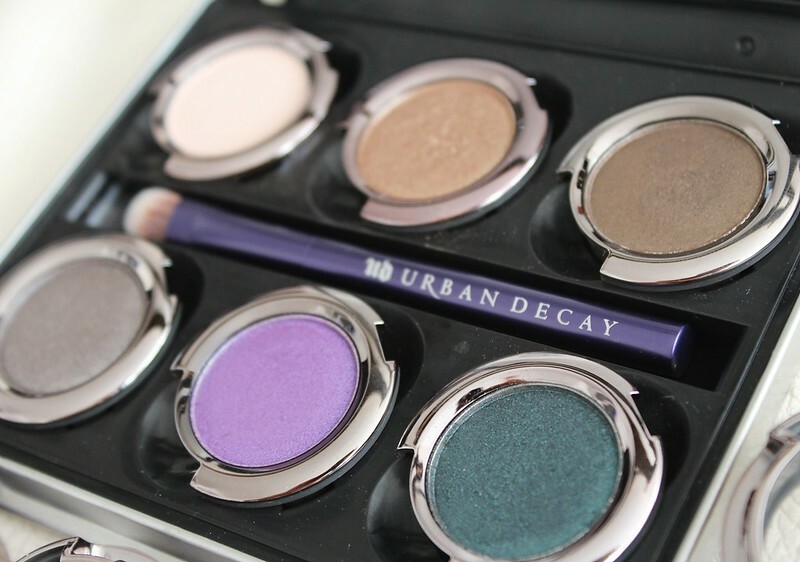 Urban Decay - Build your own palette! Urban Decay have jumped on the palette bandwagon, but did they need to? The eye shadows are also £14 each, so to fill up the 5 spaces it would cost you £14 X 5 = £70. What? what? £70 for a palette? Hmmm, no bueno!!! On a good note, the eye shadows slot in and out easily and still fit the old pans. The palette is similar to the Naked2 palette with its metallic casing that clicks closed. 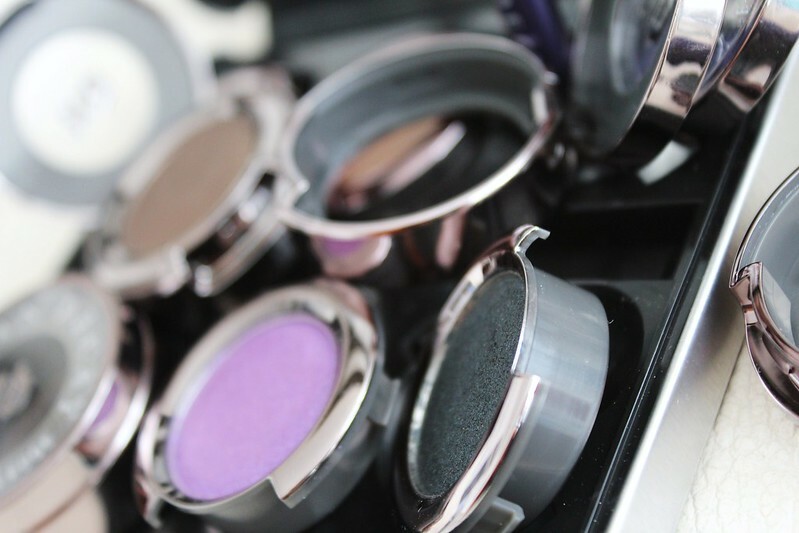 The eye shadows have been reformulated and repackaged. 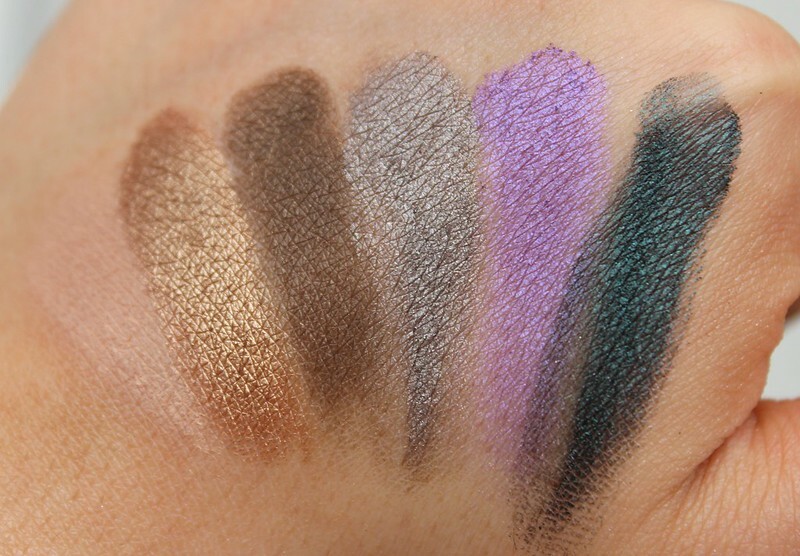 The pigmentation is AH-MAZING, just take a look at the swatches of the colours I chose! However, the price for the palette is a very steep when you can pick up they ready made palette from Urban Decay for less than half the price with more shades, yes the colours wouldn't be full size, but that's OK with me. Also, the size of the palette for 6 shadows, is a bit bulky in comparison to a Mac palette that fits 15 eye shadows or 26 with the divider taken out. It's even bulkier than the Naked 2 palette. In conclusion it is a gorgeous palette but I don't think I would have gone ahead and purchased the palette with my own money if I wasn't sent it. However, I am very glad that I do own it as I LOVE the shades I chose and will still take it on holiday with me even though it's bulky as it's very sturdy. Would I recommend it? No based on value for money, but yes if you are a lover of Urban Decay single eye shadows or you have a large wallet! I wish Urban Decay would do a discount for the eye shadows when purchased in conjunction with the palette. Hint hint! What do you think of Urban Decay's 'Build your own palette'? Disclaimer: This palette and its contents were sent for consideration for review. I love Urban Decay, but I agree with this palette being expensive! I do love urban decay shadows and i think this is a brilliant ida theyve come up with but I agree with you on the money side....not everyone in this economy can afford £70 for a palette..Looks heavier too. Pigmentation and the full size pans are a huge plus however the price point IS a bit steep, however I scroll back up and look at your swatches and feel my control starting to slip. Haha. The colours you got are beautiful. Loaded is such an incredible colour, definitely my favourite. I really like Mushroom as well. I agree that buying individual eyeshadows to build your own palette is quite expensive, especially when pre-made palettes are about the cost of 3 of these individual shades. The bulkiness of the palette is also a downside as well. It seems like such a great idea, but the price is incredibly prohibitive. I am more than willing to "settle" for the pre-made palettes, especially because I find that I will try more colors than I would have if I just stuck with my faithful neutrals that I tend to buy. I love the colours you chose! I do think I need some of them in my life! I think I'd be more likely just to buy individual ones though. It is a pretty palette. I like the customizable factor. Too bad you didn't like it as much. The idea sounds very cool. It really is such a great idea! But i think it's far too expensive and there are so many other better alternatives on the market even though they re-formulated their eyeshadows, i don't think it's worth the £70 price tag! 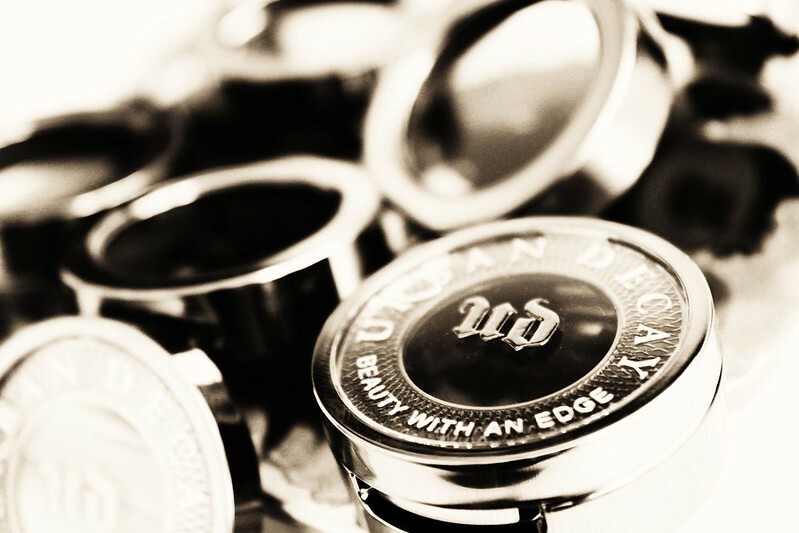 love urban decay eyeshadow so its a great idea! amazing! love the colors that you picked! It looks lovely but I agree the price is too much! This is limited edition and it's getting harder to find here in the US. I love mine though but went to get a second and they sold out at my local Ulta. to generate a top notch article… but what can I say… I hesitate a lot and never manage to get anything done.